Families shopping for a new car in the Crystal Lake and Elgin, IL area should know one thing: Honda beats out key competitor Nissan in Insurance Institute for Highway Safety (IIHS) crash tests and safety ratings. Here at Brilliance Honda of Crystal Lake we know that safety is important for your family, so if you’re trying to find a car that provides superior crash test ratings and safety features, then you should find out how these two brands compare by reading on below. In this year’s Insurance Institute for Highway Safety tests, Honda beat out Nissan with a total of seven Top Safety Pick Awards. Nissan vehicles only received three Top Safety Pick rankings from the organization. The 2015 Honda CR-V also received the Top Safety Pick + ranking, thanks to its superior crash test rankings and the availability of the Honda Sensing preventative safety system, which earned an Advanced rating in the IIHS Front Crash Prevention category. No Nissan model achieved this ranking. The six other Honda models that earned the Top Safety Pick honor from the IIHS include the 2015 Honda Odyssey, 2015 Honda Fit, 2015 Honda Civic Coupe, 2015 Honda Civic Sedan, 2015 Honda Accord Coupe, and 2015 Honda Accord Sedan. The Nissan models that achieved the Top Safety Pick ranking are the 2015 Nissan Rogue, 2015 Nissan Pathfinder, and 2015 Nissan Altima. That means that no Nissan model in the subcompact car segment, small car segment, or minivan segment earned good enough scores to make the list. If safety is your priority and you’re looking for a vehicle in any of those categories, the Honda models will prove to be safer according to the IIHS. When you compare models that are direct competitors that both received the Top Safety Pick Award, such as the 2015 Nissan Altima and the 2015 Honda Accord, the Honda model still yields better scores. In that comparison, for example, the Altima only received an Acceptable score in the Small Overlap Front Crash test, while the Accord received a Good score. 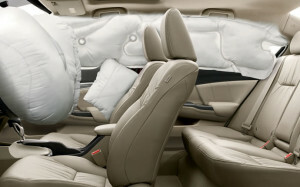 The Accord is also available with Basic Front Crash Prevention, while the Altima doesn’t offer any at all. It’s clear that the Honda vehicles win more honors from the Insurance Institute for Highway Safety than Nissan models. Come check out the latest Honda lineup here at Brilliance Honda of Crystal Lake at 680 W. Terra Cotta Ave. near Elgin, in Crystal Lake!